In order to be healthy, whether human or canine, one must do regular grooming. Dogs, not unlike teenagers, may need a little gentle coaxing, but will benefit greatly from simple at-home regular grooming. The more often you groom, the more conditioned they get to the treatment (literally and figuratively! ), so start early and lather, rinse and repeat often. This seems like a simple step, but it’s important. Many dogs simply love the attention that regular gentle brushing gives them. Dogs with undercoats benefit greatly by regular brushing, especially in the spring and summer when they are shedding their winter fur. Brushing a dog is not unlike brushing your own head, in that it helps spread natural oils and loosens up dirt or debris. This is also a great time to check for fleas/ticks and to see if your dog has any tender areas that may need to be checked out by a vet. 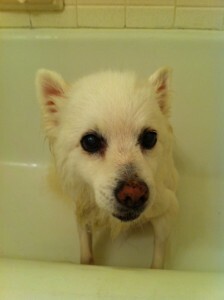 Scrub-a-dub-dub and get the dog in the tub! Dogs roll in the grass and dirt, play in the bushes, dig in the mud and lay on the ground. All that dirty play has an effect on your dog’s coat. Fur is like a sponge and regular bathing can keep dirt from building up, which might lead to irritated skin and excessive scratching. Make sure the water is lukewarm and always use a gentle hypo-allergenic natural dog wash. Dogs have varying levels of enthusiasm for bath time, so you might want to do tip #3 (trim your dog’s nails) before hopping into the tub. Long nails on dogs can cause them unnecessary pain. A good pair of nail trimmers with a safety guard can help you feel confident that you won’t accidentally cut into their quick (a vein that runs partially into the nail) and regular leg massages will keep them relaxed when you handle their feet. If you’ve never trimmed a dog’s nails, have your vet show you the safe and easy way, because your gentle confidence will make the experience smooth and fast for your dog as well. Yuck mouth doesn’t just stink, it’s unhealthy! You can use a gentle children’s toothbrush or a special brush designed for a dog. Brushing at least 2 times a week will keep periodontal disease at bay, which in turn will keep your dog around longer. Just don’t try to achieve that Colgate smile and avoid using human toothpaste. There are many affordable dog dental products on the market that are safe to swallow, and taste good too! Ears are a fantastic environment for bacteria to breed. They are cavernous, dark and often moist. It’s important to check your dog’s ears regularly to see that they are dry and clean and not irritated. After bathing or swimming, gently but thoroughly dry the inside of your dog’s ears to make sure no moisture is left. Diluted apple cider vinegar applied to a cotton ball is an easy weekly maintenance cleaning and works as a natural antiseptic. Dogs with big floppy ears are especially prone to ear mites and bacteria growth, so be sure to check them out frequently. Grooming your dog at home is a great way to bond with your pooch. They love the personal attention and adding one or two things a week will take you no time at all. A clean dog is a healthy dog and is much more likely to get hugs and kisses than a stinky dog. If all else fails, there are plenty of professionals who groom dogs for a living and you can find one at: https://www.doggeek.com/dog-groomers/ where you can make regular spa appointments if you need a little help. 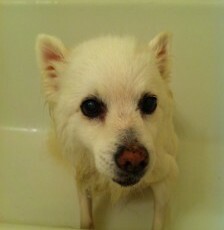 Remember, cleanliness is next to Dogliness!